North Church is EXCITED to host Avenues of the Soul – a FREE clinic for our community on September 28 and 30, 2018. This is our second year hosting the clinic – last year we treated over 180 patients, and we want to increase that number this year! Are you signing up to volunteer? Click here to complete our online volunteer form. On Friday and Sunday, September 28 and 30, we’ll host a FREE dental and vision clinic for our community. We’ll be providing eye exams and prescription glasses, and dental fillings, extractions, cleanings and restorative work. We will have licensed optometrists and dentists performing this work for our community, and there is NO CHARGE for any of these procedures. The clinic opens at 8:00 a.m. and runs to 4:00 p.m. No appointments are needed, but we suggest you come early to ensure that you get a slot. On Saturday, September 29, we’ll host a community block party and health fair. We’ll feature live music, encouraging messages of hope, free food, giveaways (including a big screen TV), a moon bounce and other activities for children, and much more! We start by offering free breakfast at 10:00 a.m. Then the fun will run until about 1:00 p.m. Please plan to stop by. You don’t want to miss out. 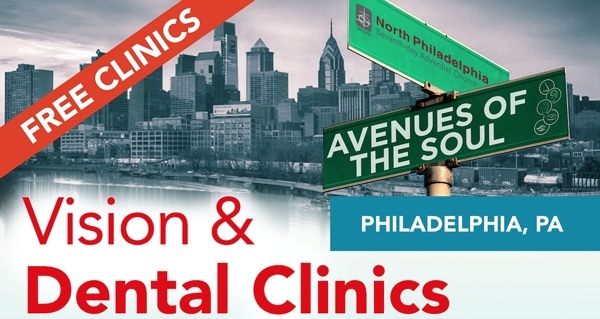 If you have questions about the clinic, email us at health@thenorthchurch.is or call the church at 215-235-1001. We are recruiting volunteers to help at the clinics. Dentists, dental assistants, optometrists, ophthalmologists and their assistants are especially needed. However, there are many different areas where non-medical professionals can assist, including registration, working with the children, hospitality, and more! If you’d like more information on volunteering, please complete our volunteer form. We look forward to serving the vision, dental and medical needs of our community and seeing you at the clinic! Please tell a friend!